Manchester United Women will begin their historic footballing campaign away at Aston Villa this afternoon. 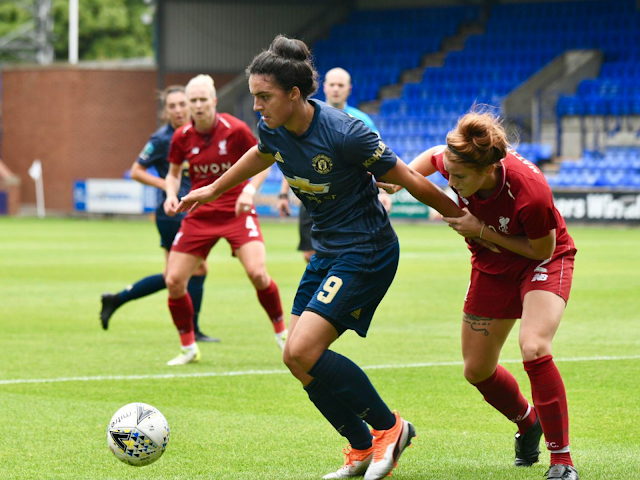 Having beat their fierce rivals Liverpool in the opening Conti Cup game, and putting in a positive performance in a loss to Reading, the excitement around this team is beginning to build. Their resilience and passion is something that is resonating amongst fans and encouraging them to back this new, young and slightly inexperienced side. With promotion the main goal for this season, United will be hoping to kick off with a convincing win to send a message to their league opponents. ''It's very important for us [to make a good start in the league], we've been building up to this. We've had two, I think, good performances on the pitch in the cup and now it turns to the league,'' Stoney told MUTV. Team morale is evidently high, and this will no doubt be aided by the players returning from international duty after the last week. Toone, M. Turner and Zelem are returning from England's U23 camp after playing in Norway, all three of whom got a lot of playing time across the Nordic tournament. Greenwood comes back after being selected for England's senior team for their final two games of World Cup qualifying. The left-back played just one of the two games, playing a vital part in helping England secure automatic qualification vs Wales. Meanwhile, Lizzie Arnot and Kirsty Smith helped Scotland secure World Cup qualification for the first time ever - a historic moment for the pair and their country. After such a successful international break, there will be a certain buzz in the United camp and the players will surely be excited to get going. United won't be the only team looking to make a statement with Villa failing to win any of their last six, drawing one, two of those defeats coming in the opening Conti Cup ties. Newly appointed Villa manager, Gemma Davies, won't be feeling disheartened, though. Her new-look Villa team will be rearing to go and what better and bigger stage to make a statement than in their opening league fixture against Manchester United? Ultimately they'll be hoping the home advantage and help of fans will carry them through to victory. ''We do a lot of work as a group of staff and players but fans are just as important to what we do,'' Davies tells Villa. With both teams looking to make a statement with a win, United's mesh of experience and youth will be hoping to prevail and secure the three points. The game will, unfortunately, not be aired by MUTV - however, Aston Villa will be streaming the game live from the YouTube channel - kick off is at 3pm.